An astrolabe is a plane representation of the celestial sphere obtained by a special projection called sterographic projection. But it shall be considered more as an astronomical calculator allowing to calculate rising, setting and meridian crossing hours of any astronomical body (star, planet, Sun), to convert coordinates from one system to another (horizontal, equatorial, ecliptic), or to find azimuth, altitude, right ascension, or declination of a star, etc. 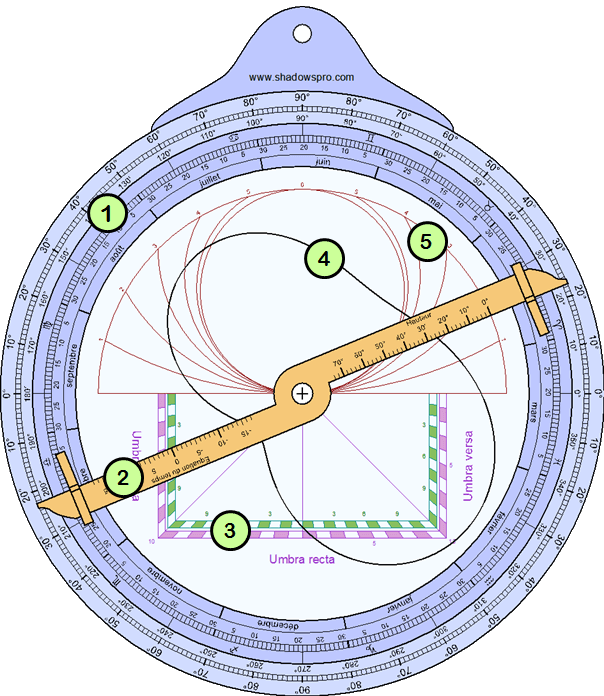 The origins of the astrolabe are not very precise; We know the early contributors who wrote the first treatises on the astrolabe, between the 3rd and 6th century, and we know also that Ptolemy wrote an essay on the stereographic projection in his book planisphaerium, three centuries before Christ. Litterature around astrolabes really florishes between the 9th and 12th century, especially with the numerous translations of ancient Greek and Arabic treatises, and also with the conquest of the south of Europe by Arabs, leading to the famous Spanish-Arabic school whom Arzachel (Al Zaqali) is the most famous member. The astrolabe spreads between the 12th and 16th century, on the one hand towards Orient and Persia, and on the other hand accross the rest of Europe, especially Paris, Germany and Netherlands where artisans and goldsmiths, who were not always scientific or astronomers, made beautifully decorated astrolabes. 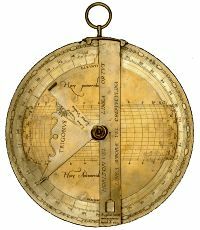 They used to replicate existing astrolabes and sometimes they introduced errors. 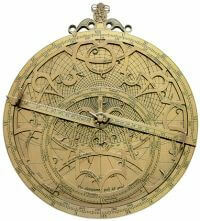 One of the most famous astrolabe makers is Arsenius from Belgium. The 17th century marks the beginning of astrolabe clocks, such as the famous clock in Prague. 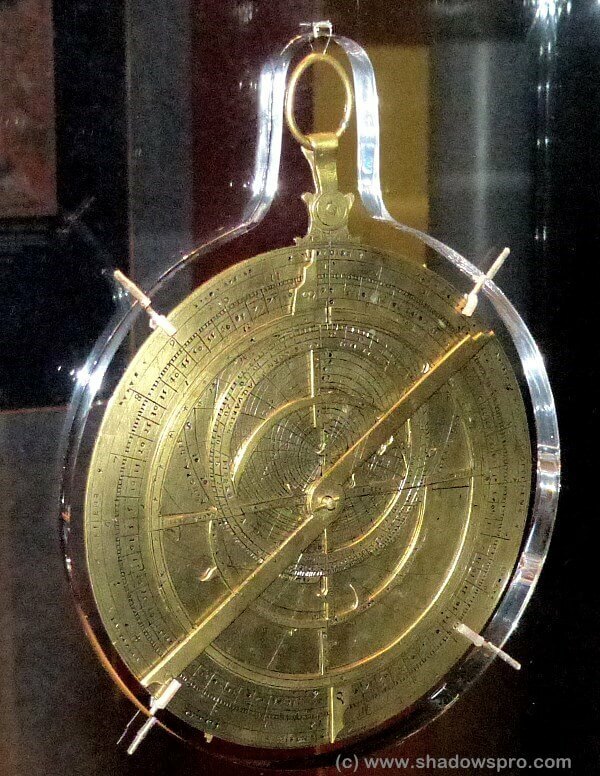 Today, we can see astrolabes in museums, observatories and planetariums, such as the museum of Arts et Métiers or the Louvre in Paris, observatories of Paris or Greenwich, museums of the history of science of Geneva, Oxford or Firenze, maritime museums of Madrid or Barcelona, of the Adler planetarium of Chicago, etc. 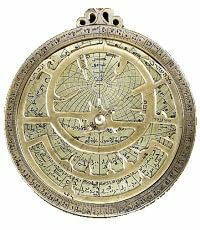 The astrolabe had a strong influence on various arts and has become the symbol of exploration and scientific knowledge. Examples can be seen in painting, sculpture and even on stamps, money and watches, on the page Astrolabe in arts. It is also not so rare to see an astrolabe and an armillary sphere in movies when a scientific lab is shown, such as with Dumbledore in Harry Potter or in the travelling bag of Guillaume de Baskerville in The name of the rose. at the Smithonian Air and Space museum in Washington. 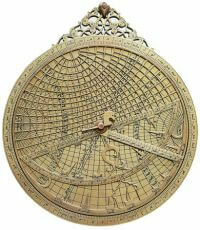 The astrolabe has a net of lines on both sides, for a different and complementary usage. Therefore, front and back of an astrolabe are described separately. The back is usually the same on a planispheric astrolabe and a universal astrolabe, either a Saphae Arzachelis or a Rojas astrolabe. 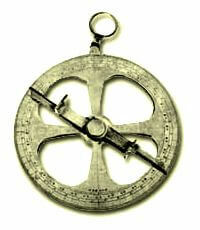 The mariner's astrolabe does not have any back as it is pearced by large holes. And quadrant astrolabes show various drawings. 1 - the limb of the back is scaled with various information. 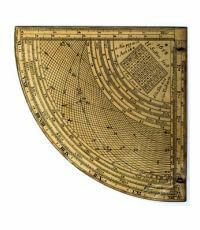 A calendar gives days and months and allows the determination of the ecliptic longitude in function of the day. The 1/4 of circles are scaled in degrees for using with the alidade. 2 - the alidade is rotated around the central axis and is used to point a star or the Sun with the two pinholes to get its altitude. It is also used to designate a value on the limb. 4 - curve of equation of time, used with the alidade's scale and a date on the limb.